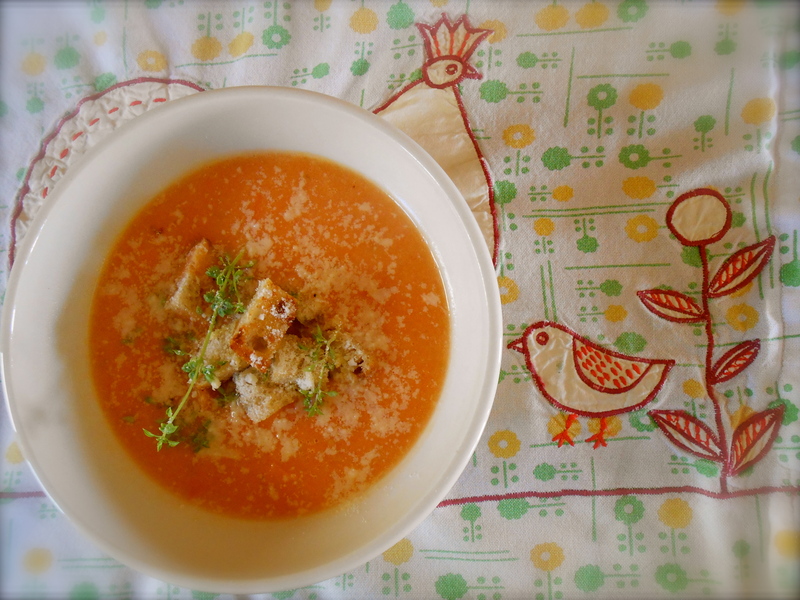 For this particular recipe a medley of tomatoes straight from the vine went into this garden tomato soup. A very sweet and firm fleshed tomato called “Plum Lemon”, which is a russian yellow tomato that looks like a lemon! An heirloom striped tomato which looks like a bell pepper and also harvested were several plum tomatoes to add to the mix. Straight from the vine and into the soup pot. 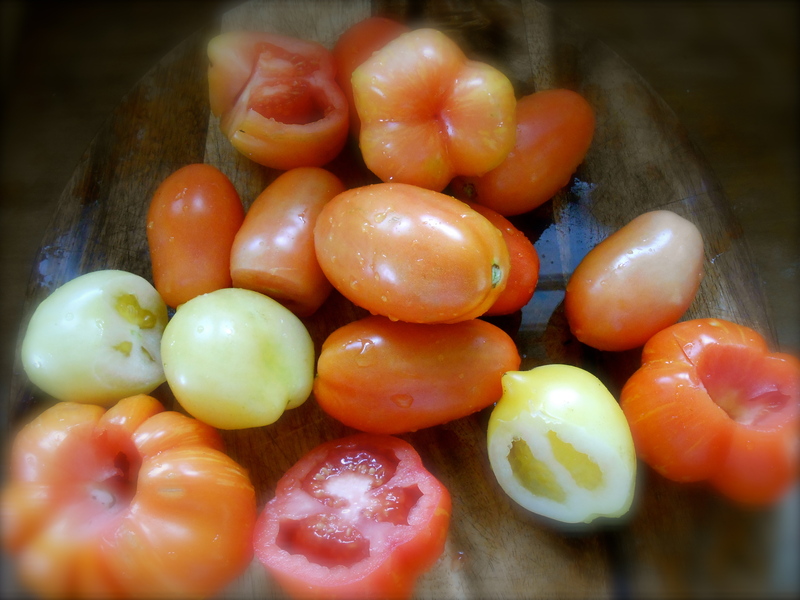 The yellow ones are not lemons…they are yellow plum tomatoes! This soup had a slight tanginess to it as well as an herbal infused flavor which came from sprigs of fresh cut greek basil and thyme. I chose to keep the sprigs whole and remove at the end in order to keep the soup texture silky smooth. Both the thyme and greek basil seem to have a toughness about the leaves and I was looking for a nice smooth finish. Place the oil and butter in a large heavy bottomed pot and heat until butter melts. Add the onion and sauté over medium heat until soft, about 8-10 minutes. Add the tomatoes, thyme, basil, salt and pepper and stir to mix. Bring to a boil and cook over medium heat until the tomatoes have collapsed, 6 – 8 minutes. 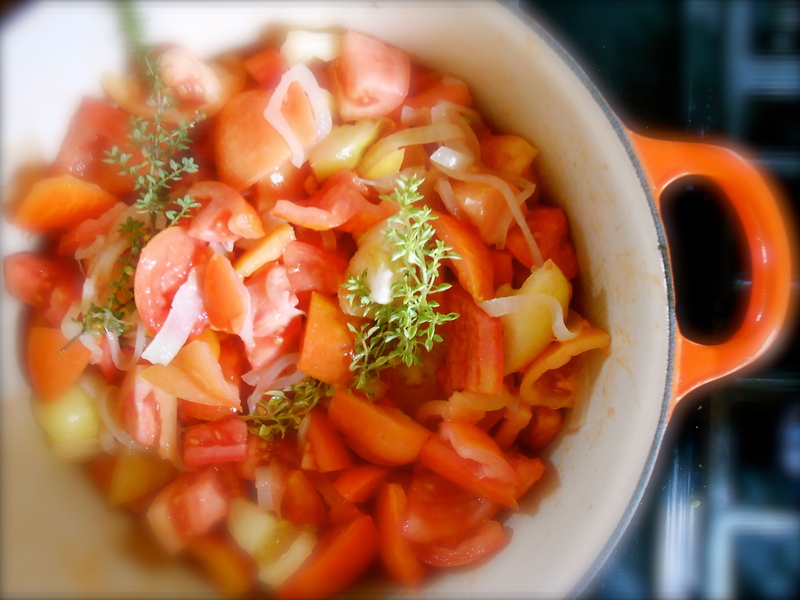 While the tomatoes cook, heat the stock until beginning to boil. Using 1/2 cup stock in a cup, whisk the flour to make a smooth paste. Add the flour paste and the remaining broth to the pot and bring to a boil. Simmer for several minutes on very low heat, stirring frequently. Turn off heat and cool enough to handle. Using a hand blender (or blender) purée the soup until well mixed. On several occasions I have read by adding a pinch of sugar to tomatoes rather it be a sauce or soup, helps to soften the acidity of the fruit and boost the tomato flavor. I did add a pinch of sugar and I can not say if this had an effect on the soup or not. It was so delicious and it seems using fresh tomatoes right off the vine you can not go wrong. At this point I passed the soup through a sieve to catch the skins and bits to achieve a silky smooth texture. I think this step is optional, it was wonderful even left a bit rustic and chunky. Topped with oven toasted croutons, fresh grated pecorino cheese and a few greek basil leaves. Yes! I actually made a grill cheese sandwich for my son with his tomatoes soup. I chose the homemade garlic/herb croutons for mine!. :) I love grill cheese with tomato soup, especially for dipping! This looks so perfect. Fresh tomatoes with herbs. Nothing is sweeter. I love the soft focus shots. Thanks for sharing! Oh yum! This looks fantastic! How beautiful, that soup and those tomatoes. I have never heard of the plum lemon tomato and have never seen it here. It looks amazing and that soup with the bread cubes, cheese and basil. Delicious. First time I have seen the plum yellow tomatoes too. I didn’t know what to expect when I bought the little sapling. Quite surprising how they resemble a lemon. They were wonderful in the soup that is for sure. Fantastic photos and I love how you are keeping a bit of summer going. Clever use of herbal infusions. That’s the way to do it. You know, I’ve never made tomato soup. You made it sound so easy… I think I may have to give it a try. It looks so delish, the croutons, the cheese…just perfect. I adore tomatoes and seek out the heirloom varieties. The flavours are soooo much better than modern strains. Your soup sounds wonderful and it’s cold enough here to need soup! Heirlooms are so fun too! I love the shapes, sizes and various colors. And I agree, they are so flavorful. I usually pick two or three heirloom saplings every year and have not been disappointed. They always grow so beautifully. This is one delicious soup and what a variety of tomatoes! Yellow plums? Who knew? Thank you John. Yellow plums, shaped like lemons, where do these varietals come from? I half expected to taste a bit of lemon when I bit into one. Thank goodness it was all tomato flavor! And quite a tasty one too. must be that season. i just finished my creamy tomato basil soup post, so it’s great to see i’m not alone in hankering for a hearty, fresh, smooth, and savory soup. I’ll check out your soup! I thought about adding a bit of cream to this one, then thought…next time. Love tomato soup! I have only made it from scratch a couple of time now. Certainly raises the bar, I can not see myself buying it pre-made from the market ever again. Oh this sounds fabulous! I seen grilled cheese sandwiches cut into bite sized ‘croutons’ in Food Network Magazine…they would be perfect with this!! more tomato recipes–yay! This one looks especially lovely. And those tomatoes are so much fun :-) Love the different sizes, shapes, colors. Love this recipe. I have all the ingredients in my kitchen. thanks! Oh, your own harvest! How wonderful it must be to be picking out those tomatoes from the vine. I can eat them raw. The light soup looks delicious! HI Dolly! I certainly ate my share of raw tomatoes this season. We would just stand at the garden and pick the little cherry sized tomatoes and eat them. Very nice to have enough to make a large pot of tomato soup. My favorite. Good! Hope you get loads and loads of tomatoes. Can never have enough and this soup is certainly a great way to use them. You’ll be so happy you made it. Nothing like homegrown vine ripened tomatoes. Hi Ruby! I’ve never seen those pretty yellow tomatoes. And what a yummy looking soup. My little one and I just love tomato soup and we just might give this one a try… minus the pretty yellow tomatoes as I don’t think I’ll find those around here. Looks delicious. I will save this recipe for when my tomatoes are ready to harvest in December (going into summer here in Brazil). Two things…I’ve never made tomato soup. And (I’m almost chuckling as I write) I’ve never tried basil, of any sort, with thyme! Why?! I love both of them. Why not together. My Greek style basil still has loads of tender looking tips left. Or are they as tender as they appear. I think the flavour by now will be too intense to use. And no new basal growth on the original plant. Still, refuse to throw it out! And those toms really do look like lemons! Interesting how the greek basil became so tough. It is similar to fresh thyme in both stem and leaves. And yes! the flavor is a bit too intense to use. Last time I used it in a pesto (before this soup) after chopping it I ended up tossing it in the yard waste because it was so stemmy and tough. I’m with you, can’t throw out the plant though. Worked well here, was able to let it simmer in the soup and toss it out at the end of cooking. Thank you for stopping by! I made your tasty soup & it was just divine,..really tasty! I love your chicken & chick napkin! Thank you Ada. This was the first time I had seen this particular heirloom tomato too. Thank you for stopping by and for your comment. You are currently reading homemade tomato soup at COTTAGE GROVE HOUSE.